Diary of a Miner: Day 59: Recuperate today, destroy portal tomorrow! Day 59: Recuperate today, destroy portal tomorrow! Today I woke up with a pain in my back; it seems sleeping on hard floors has finally taken its toll! Regardless of that, I woke up early enough to make a start back home! I had seen the raw power of the magic stone obliterate a portal yesterday, and I was in high spirits to see it do the same to the rest! Of course, I only knew of the location of one more, but I'm hoping that THEROS can help in that department... Collecting my stuff up, I checked the hidden switch to make sure the slabs were in place, I replaced everything that had been moved to its near previous position, and set off... It was a LONG walk back, and I needed to destroy that other portal by the end of the day, even if it meant camping out on the island! 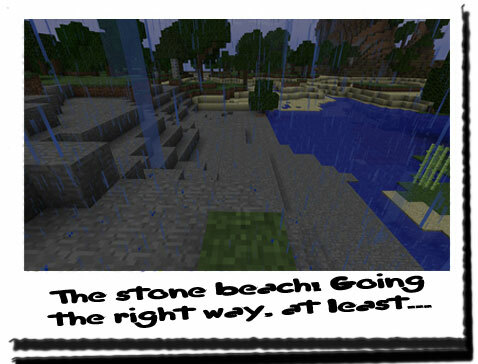 I quickly made my way South-West towards the stone beach, partly because of the rain, but mostly in fear of being ambushed! There was going to be a small section which had trees all around, but it was only for a few hundred metres... After abut two hours I had made it back to the stone beach, happy at seeing it! From here I could at least make an accurate guess on where to head next, and in turn to shorten my journey! I was tempted to cut out the cliff, pools and trees altogether and skirt around the Southern edge of the land back to the beach area outside the gate, but I would be taking an unfamiliar route which may lead to a downfall. No, best stick to the route I knew... sort of! I stood under a tree close to the beach for awhile, getting my energy back, and to shelter from the rain. I don't think I'll be stopping for lunch on this journey, unless the rain let up! From the stone beach, I began to head due West to the small area of trees that would join to just where the end of the cliff was. From there I would trace the cliff North back to the pools of water and then continue West again. It took about fifteen minutes to get to the trees, and I made the crossing to the cliff side very quick, not wanting to risk anything! As I almost sprinted through the trees, I kept a watchful eye on all sides, and my free hand on the sword! I was prepared, but after the short run, the trees cleared, and the huge cliff stood before me! I was clear from the most dangerous bit... Back on with the arduous walk to the pools! The walk North was long and wet; the rain hadn't eased at all, but it wasn't getting any worse. The map was a bit damp, but I only took it out every now and then, and usually under a tree. After a few hours or so, I came to the the huge waterfall I had found a few days ago which had been the area I used as a crossing point to the strange island. I was still on the right track, and after turning to head West, I was back in front of the pools within less than half an hour! I stopped off at the side of one of the pools, and bent down to have a drink; I'd walked for a few hours without a stop and I was beginning to get tired. I knew it wasn't long from here on, but a little rest was in order. I sat underneath a nearby tree, looking back at the note. Despite all instincts telling me not to, I reached into my bag and took out the stone! It was back to the yellow it had once been yesterday, but it was not glowing yellow! There were no portals around here, obviously. Suddenly, I heard a noise behind me and I quickly, but stealthily slipped the stone back into the bag... I stood up and turned around, my hand on the hilt of my sword again, but there was nothing there... Looking around, there was only the rain falling onto the pool... Calming down slightly, I decided to go with my intuition this time, and picked up my bag and left for West again! If I kept going on from here, it would only be a matter of hours until I saw the lights of the wall! I got lost, a little bit... I had put the map away in my bag to stop it from getting soaked entirely; the rain had increased rather dramatically, and I had taken to using the sleeping bag as a coat! As the rain came down, a fine mist-like fog began to settle, making everything seem murky... This made it harder for me to see my way, but I pushed on West as accurately as I could. After another hour of what seemed like aimless wandering, I stopped under a tree and checked the map against the compass... Finding the direction was fine, assuming the compass was accurate, but as for pinpointing my location... The fog had grown quite thick, and seeing objects from long distances was making it difficult for me to identify my location! After a few minutes of squinting into the rain, I decided it would be best to continue onwards West, hoping I would at least hit the beach near to the ship. The lights from the ship and the wall and towers would be enough for me to know where I was, even from a distance! It was at this time I felt rather glad I had extended the towers; the torches would be protected from being extinguished! After what seemed like ages of squelching along the sodden grass and mud, I came to a small hill. Taking the opportunity, I climbed to the top to survey my surroundings, in the hopes that something familiar was nearby. What I saw filled me with relief; I wasn't off track at all, I couldn't have been more on track if I tried! I rushed down the hill, careful not to slip on the slick sand, and continued onto the wall! Knowing the usual routine, I left the bag and tent outside the gate; they wouldn't fit in the tunnel up to the tower... Placing the bag down, I fished inside for the stone; I wasn't leaving that behind! Keeping it in my hand, I rushed around to the hidden entrance, removed the wooden slats and climbed through the tunnel, up the ladder and into the tower. From there I made my way down the wall and outside the gate, where I retrieved my bag. I locked the gate again, and turned to the farm; the wheat was doing well, although I couldn't help thinking it would've done better if there hadn't been a roof! The rain would have done them the world of good! I turned to the stairs, and already I could hear Chiron, barking away with joy at my return! 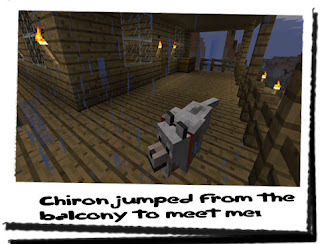 As I Began to head up the stairs, I saw Chiron peer down from the edge of the balcony and then leap off! He was that eager! I greeted Chiron as he did me! Just as he turned to go to the front door, a flash of lightning split the sky, and a thunderous boom roared overhead! Needless to say it scared me, but Chiron did his usual thing; he ran into the corner of the porch, and buried his head in his paws! I quickly opened the door and he bolted in past me... What a softy! It's started to get dark now, so the other portal will have to wait until tomorrow. I think the rain would've put me off anyway to be honest! I've thoroughly dried myself off, and Chiron is MUCH happier I'm around; he hasn't left me alone since I got back! I unpacked my bag in my room, with Chiron on my bed, snoozing away. But as soon as I took the stone out of my bag, his ears lay flat, he looked at me and began growling at the stone... What did that mean? I put the stone away, back in the bag, and his growl slowly eased off... His ears pricked up and he began panting again! But as soon as I moved my hand with the stone in it, he went back to the vicious self! I hadn't even got the stone from my bag! I don't think I'll be taking Chiron with me to destroy the portal tomorrow... Probably too dangerous anyway... Then I remembered: the Creepers! There had been quite a few near the portal, almost like they had been guarding it! I didn't know what to think at the moment, but I would need to find a way to get rid of them if they were still there! For now though, I'm having an early night! I REALLY need the rest!